There has been no shortage of attention paid to the opioid crisis—the shocking statistics and devastating stories—yet solutions to the problem are still in short supply. 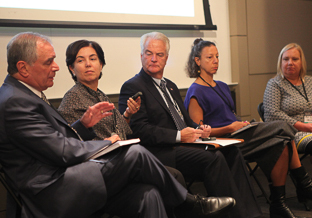 In late September, Columbia Mailman School faculty participated in the Empire State Opioid Epidemic Innovation Challenge, a three-day competitive brainstorming session to generate ideas to address the crisis in New York and beyond. Organized by the Consortium for Affordable Medical Technologies, a nonprofit based at Massachusetts General Hospital, and co-sponsored by the Columbia Mailman School, the event at Columbia’s Engineering School brought together government officials, scientists, and students for a series of panel discussions followed by a “hackathon.” Alan Batkin, co-chair of the Columbia Mailman Board of Overseers, served as one of the judges. Winning concepts included an online chat system to refer people to opioid recovery programs, a peer support system for those in treatment, and a nasal patch version of the naloxone antidote to prevent overdose. Like much of the country, New York has been hit hard by the opioid epidemic. Between 2010 and 2015, the rate of deaths from opioid drugs doubled, while the rate of heroin deaths climbed five-fold. However, the worst may be over. In a keynote speech, New York State Lieutenant Governor Kathy Hochul said some progress is being made through programs that treat opioid deaths as a public health crisis. As chair of the Governor’s Task Force on Heroin and Opioid Addiction, Hochul developed policies like I-STOP that limits prescriptions for opioid painkillers from a month’s supply of pills to week. At the same, the state has expanded access to naloxone and launched a fleet of mobile units to bring treatment to opioid users in rural counties. One of the areas of the state hardest hit by the opioid epidemic is Staten Island, where an overdose happens every day, and an overdose death every third day. In 2017, Silvia Martins, associate professor of Epidemiology and a prolific researcher on drug abuse prevention, contributed to a report on the opioid epidemic in the borough issued by the Staten Island District Attorney’s Office. The authors found that opioid addiction was experienced across races, ages, and socioeconomic backgrounds—not just the white affluent youth singled out in media reports. Later at the hackathon, Martins mentored two of the twelve teams competing for cash prizes: one that proposed a specially designed pill dispenser to prevent misuse, and another that recommended adding a chip to naloxone (Narcan) dispensers to report its geolocation to the local departments of health as the dispenser is used. “This [technology] would help planning for educational messages at the local level targeting close friends and family of people that overdose,” said Martins. What’s the Right Prescription to End the Opioid Epidemic?